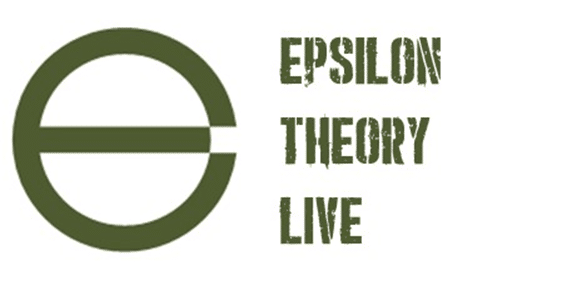 We hope you’ll join us HERE for the next edition of Epsilon Theory Live! on Wednesday, April 24th at 2PM ET. Remember that ET Live! is a subscriber-only event, so if you want to participate with this unique interactive feature, please make sure that you’ve subscribed to either our ET Premium or ET Professional service. All this, plus Russell Wilson continues surfing the Zeitgeist like no one else. China’s Belt and Road Initiative is back, baby! Just needed a little narrative happy face of “respect for global debt goals” and “promotion of green growth”. That plus multi-billion dollar non-recourse loans at 2% for a high-speed rail to nowhere. Plus more on Walmart robots, ESG, and of course Free College! Just another day of you can’t make it up, fresh from the ET Zeitgeist. The Monday Zeitgeist today is about companies actually being allowed to go bankrupt, the usual DB/CBK chatter, money flow cartoons, great moments in bad metagame, and a decent little personal finance column. This Weekend Edition is a bit of a downer, but the Zeitgeist is what it is. And the non-financial markets Zeitgeist right now? It’s all about poverty, the spirit of poverty and how people transform our concerns about both into political power. We know what fiat news is: the presentation of opinion as fact. We also know what fiat news looks like: pop on over to Vox and skim a few stories. But how does fiat news WORK? New from ET contributor Demonetized, a clear-eyed look at wolf traps and sales funnels. What Herman Cain would bring to the Fed, what Socrates brings to the MMT debate, what Pinterest and Zoom bring to the IPO market, and what work European PMs bring home when the markets are closed. All in a day’s work for a Good Friday Zeitgeist.